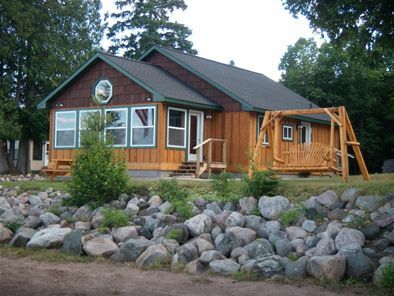 Musky Point Resort is a family owned resort in Northern Wisconsin. We have been in continuous operation since 1925. Lake of the Falls is a 240 acre DNR stocked lake. Our modern cabins face 400 feet of the best natural sand shoreline in the area. Beautiful Lake of the Falls is the headwaters of the Turtle Flambeau Flowage. Lake of the Falls connects to Turtle River, Moose Creek, Dollar Creek and the three Black Lakes. With over 200 lakes in a twenty mile radius and nearly 300 miles of trout streams, your fishing possibilities are endless. Walleye, northern, sturgeon, crappie, bass, pan fish and trout will lure you to the water’s edge. Most sought after is the ever eluding trophy Musky! Winter brings even more fun with some of the best snowmobiling in the state. Ski hills are within 30 minutes of the resort. Cross country skiing on groomed trails are within minutes or you can ski right on the lake.